In the seaside village of Watchcombe, young Kate is determined to make the most of her last week of summer holiday. But when she discovers a mysterious painting entitled ‘The Lord of Winter’ in a charity shop, it leads her on an adventure she never could have planned. Kate soon realises the old seacape, painted long ago by an eccentric local artist, is actually a puzzle. And with the help of some bizarre new acquaintances – including a museum curator’s magical cat, a miserable neighbour, and a lonely boy – she plans on solving it. And then, one morning Kate wakes up to a world changed forever. For the Lord of Winter is coming – and Kate has a very important decision to make. 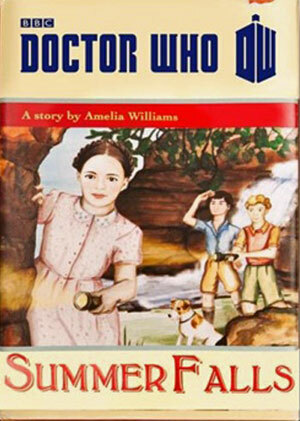 Summer Falls, a book written by Amelia Williams (yeah, right), is featured at the beginning of “The Bells of St John”, being read by Artie, one of the children taken care of by Clara (as played by Jenna-Louise Coleman).